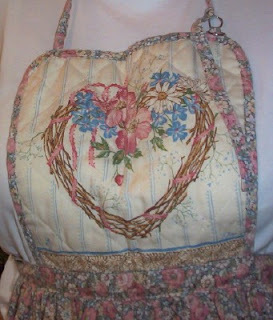 I donned my new apron for today's Valentine cook-a-thon. I found it for only a quarter at the estate sale down the street. My mother smirked, but who could resist such a soft, feminine design at this time of year? Okay, I'm not wild about the country blue and mauve, either. I think the apron is very pretty and very feminine. Just the right look for Valentine's Day! That's a cute one. No smirks from me.